Dr. Barrett is the creator of the Paintracking program and author of Paintracking: Your Personal Guide to Living Well with Chronic Pain. these conditions face is real, physical pain. How we experience this pain, however, and the role it takes on in our lives, is as much about the medical condition as it is about our feelings about ourselves and about the strength of our social support networks. We do have to take care of our physical bodies. Just as important is taking care of ourselves emotionally -- especially when we are recovering from an illness or injury. 1. Your brain wants to protect you from difficult feelings. John Sarno, M.D. writes that physical pain in disorders such as tension myositis syndrome often serves as a "protective maneuver" by the mind to keep us from experiencing subconscious emotions such as rage. This serves a purpose in keeping intolerable feelings out of consciousness. It shifts your focus from emotional pain to a different (physical) sensation. 2. The pain-fear cycle will keep you from doing things you enjoy -- until you break the cycle. Sarno proposes the idea that people suffering with tension-related disorders stop avoiding activities that they feel will aggravate their pain. He has seen patients get better, not worse, from resuming feared activities. Seek a consultation from a doctor who specializes in TMS and see if you may be able to go back to doing things you enjoy. 3. Emotions and thoughts drive the mind, which drives the body. You have the power to change your brain chemistry, create new neural pathways, and establish positive changes in your life that impact your mind and body. Marsha Linehan, Ph. D., the developer of dialectical behavior therapy, teaches that every emotion has an action urge -- a behavior that the emotion makes you want to do. Acting based on that urge will cause the emotion to re-create itself. Emotions are temporary, but they are replicated through actions. Act opposite to the emotion and you can change the emotion you experience. 5. Trauma memories are expressed in the physical body. Psychological effects of trauma lead to changes in how we biologically respond to stress. Bessel van der Kol writes in The Body Keeps the Score that trauma impacts the sensory and self-awareness systems in an individual. Constantly receiving messages of danger and distress from the brain, we become desensitized and numb. Recovery thus requires that the physical senses become re-awakened. People can and do recover from trauma, and can experience post-traumatic growth and a new sense of aliveness. Choosing a therapist is a significant decision that requires careful thought. Often, we are not quite sure why we are entering therapy. We know that something is not working and have decided to make a change. Many of us have heard from friends or family members that therapy has been helpful to them. Yet, in looking for a therapist we find that there are many different approaches and models to psychotherapy. How do you decide whom to call? One approach is to locate a therapist who practices according to a particular psychotherapy model or school of thought. 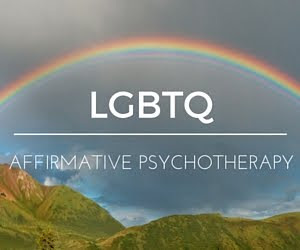 For example, some therapists practice cognitive behavioral therapy or dialectical behavior therapy, others practice psychodynamic psychotherapy or psychoanalysis, and still others use an eclectic model that incorporates multiple approaches. Most research into the effectiveness of psychotherapy models points to the conclusion that, in general, one type of therapy is not necessarily more effective than another. Most often, it is the qualities of the therapeutic relationship, as well as the client’s level of motivation and readiness to change, that lead to positive outcomes. For some problems there are certain psychotherapies that have developed a stronger evidence base. In general, though, therapy works. My perspective on choosing a type of psychotherapy is that clients should evaluate the approach that best fits their style and that they can believe in. Some people are naturally more interested in exploring the connection between their past and present, and are willing to commit to a longer-term treatment. Others are more interested in leaving every session with specific skills and techniques to take home and apply to their daily lives. Yet others want to strengthen the mind-body connection and focus on memories stored in the body. One of these is not necessarily better than the other, and even the strongest evidence-based treatment is not likely to work if it does not make sense to you and does not have your buy-in. That said, there are some psychotherapy models that have very strong evidence bases for particular problems. This should not be ignored. If you are struggling with a mental health disorder such as major depressive disorder, post traumatic stress disorder, or obsessive compulsive disorder, for example, you are likely to want (and you deserve) to receive the type of treatment that is most likely to help. People can and do recover from mental health disorders, and recovery can be nothing short of life-changing. Cognitive behavioral therapies have been proven time and again to help with these problems. Similarly, people with borderline personality disorder experience significant difficulties with regulating emotions and maintaining interpersonal relationships, often to the point of harming themselves and/or attempting suicide. Dialectical behavior therapy has a very strong record of helping people with these difficulties to create a life worth living through creating positive emotional experiences, reducing vulnerability to negative emotions, and living in a more mindful way. Psychodynamic psychotherapy may be just as effective for many of these problems. It simply has not been studied as much, so we don’t yet know all we can about what specific elements of the therapy create the outcomes we want to see. Of course, choosing a type of therapy is only part of the process of choosing a therapist. Even therapists who practice “scientific,” evidence-based treatments according to a manual bring to the therapy room their own human qualities. You bring your own human qualities as well. After all, you are far more than any “diagnosis” or “disorder” can capture. The fit between you and your therapist is important, as the therapeutic relationship will be crucial to any potential benefit you would like to achieve in therapy. Word of mouth recommendations are one way to get a sense of a therapist’s style. We tend to have friends who are a lot like us. (This is why acquaintances and extended community are so important if we are to learn new things and grow as people.) Someone who has been able to help people close to you may be a good fit for you as well. Of course, consider how you will feel about "sharing" a therapist with people you know. You may also get a sense from a therapist’s website or online profile. Eventually, you will pick up the phone and call someone who seems like they could be a good fit. You can ask some questions during an initial phone call and decide if you would like to schedule an appointment. Meeting with a therapist for the initial evaluation does not obligate you to continue working with that therapist. You may need to meet with a few people before you feel comfortable. Notice how you feel during the first meeting. Cost is also a factor to consider. Therapy is a significant commitment not only of time and energy; it is also a financial commitment. Make sure you understand your therapist’s fee structure and any insurance benefits you may be using. If you have concerns about the cost, discuss these with the therapist. The attention you give to choosing a therapist is likely to pay off as you begin the challenging and rewarding work of being in therapy. despite anything else that may be going on at the table. Holidays are a stressful time for many and one way that we tend to cope is by overeating and over-drinking. The Dialectical Behavior Therapy Skills Training Manual now includes skills specifically designed to target these types of addictive behaviors. We eat and drink too much in order to avoid dealing with uncomfortable feelings. Skills can help us to be able to tolerate these difficult emotions so that we do not need to numb them. One such skill is urge surfing. Urge surfing is a skill to bring you back to wise mind. When you are in emotion mind, you are ruled by moods, feelings, and urges. In wise mind you are able to follow the middle path and do what is most effective in the moment. Urge surfing is a mental activity: you imagine that your urges are a surfboard in an ocean. You are standing on this surfboard, riding the waves. Observe the urges. They are likely to come and go, sometimes with great intensity and other times more subtle. Eventually, they are likely to go away. Even if the urges do not go away, you are likely to find yourself more comfortably standing on this mental surfboard. Of course we must balance efforts toward change -- in ourselves or in others -- with efforts to accept ourselves, those around us, and the present moment. Mindfulness skills are a key part of this balance. You might meditate while sitting, or walking, or while observing nature. Perhaps you might engage in a more active, participatory mindfulness exercise. There are plenty of workbooks that you can use to cultivate mindfulness skills as well as to understand and accept the challenge of difficult family members. Ultimately, may you take the challenges of the day and use them to learn something new about yourself. Happy Thanksgiving. The holidays are a stressful time for many, but those with difficult, narcissistic, or judgmental family members may have an especially difficult time. Rather than living the theme of gratitude that Thanksgiving might ideally be about, you may find yourself having trouble setting boundaries with your family member and having them respected. 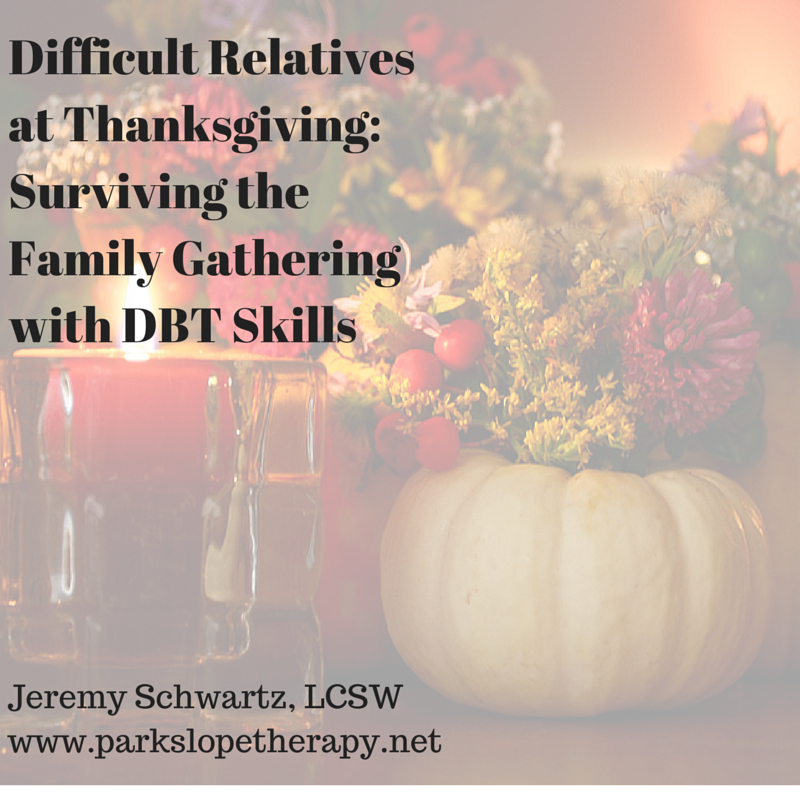 Fortunately, Dialectical Behavior Therapy (DBT) offers several skills that can be particularly helpful so that you can spend time with your family, enjoy the Thanksgiving meal, and maybe even be glad you showed up. Marsha Linehan's just-released second edition of the DBT Skills Training Handouts and Worksheets includes a skill that had been in use for several years among people struggling with substance abuse problems, but never before officially incorporated into the DBT model. The skill is called "alternate rebellion." Essentially, the idea is that rather than rebelling in a destructive way (i.e., problem drinking, drug use, and other types of self-harm), you can find a non-harmful way to assert your individuality so you are not completely complying with the dynamics of the situation that you may not like. You might wear a brightly colored undergarment, for example, or express your political views more strongly than you usually do, or something else that allows the day to be more "you." (Let me know in the comments what you think of!) In your mind you can refer back to this rebellious act when you find your difficult relative making everything about them. Another DBT skill that can be very useful with family members is validation. (Alan Fruzzetti's The High Conflict Couple provides an excellent explanation of DBT's six levels of validation as they apply in close relationships). The idea is to find the kernel of truth in your family member's experience and reflect back how what you are hearing makes sense. You don't have to (and it would not help to) validate what is wrong, distorted, or dysfunctional. But if you can find that "nugget of gold in the bucket of sand," as we DBT therapists love to say, you will be better able to relate to your difficult or narcissistic relative. Perhaps more importantly, you may find yourself feeling more empathy and less anger. UPDATE: Part 2 of this post is now available. A young man named Nasreddin planted a flower garden, but when the flowers came up so did a great crop of dandelions among them. Wishing to eliminate the unwanted guests, Nasreddin consulted with gardeners near and far, but none of their solutions worked. Finally, Nasreddin traveled to the palace of the sheik to seek the wisdom of the royal gardener himself. But alas, Nasreddin had already tried all the methods the kind old man recommended to him for eradicating such troublesome weeds. Silently they sat together for a good long time. At last, the royal gardener looked at Nasreddin and said, "Well, then, the only thing I can suggest is that you learn to love them." The story illustrates what Tara Brach (and others) call Radical Acceptance, a conscious and deliberate decision to acknowledge the reality of the present moment rather than fight against it. This does not mean to stop working toward creating a different reality, one that better matches the life you want to live. It requires letting go of many judgments, those beliefs about how things "should" be. 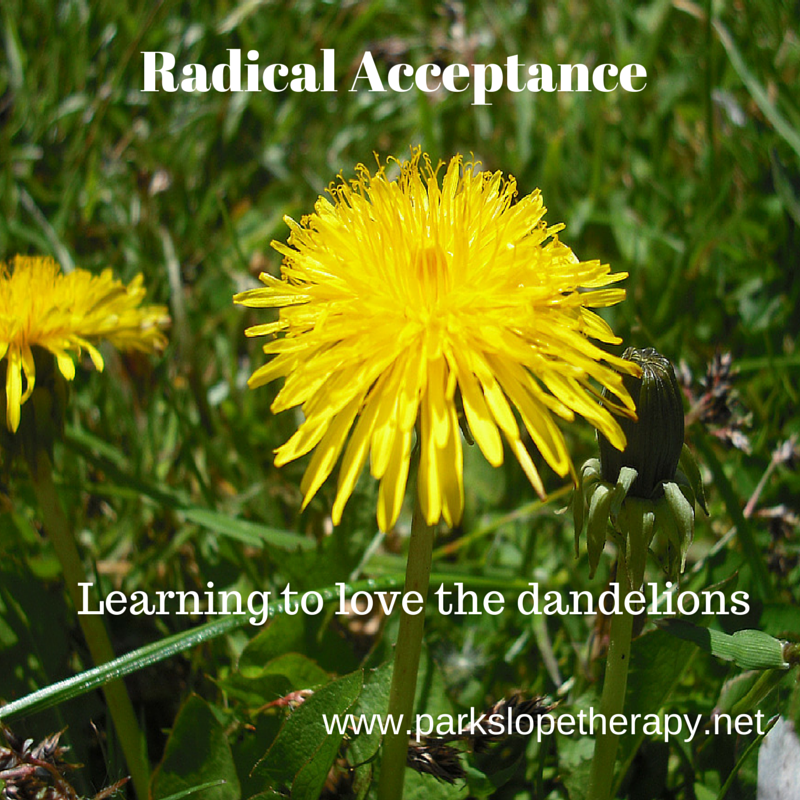 But radical acceptance allows us to focus on being effective -- on doing what works. 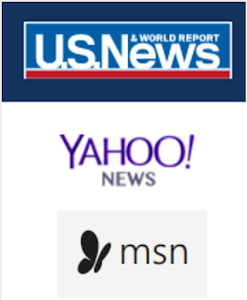 Information on this website is provided for educational and informational purposes only, and does not constitute medical or mental health advice. Obtaining information through this website is not a substitute for consultation with a qualified health or mental health professional.